Our brand new creature: “Coglia! Coglia! 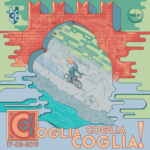 Coglia!” mixing up Bergamo’s history with some mud.